Tom Sietsema’s Fall Dining Guide 2014, published last weekend in The Washington Post Magazine, includes the critic’s ten favorite DC area restaurants. It gets me thinking about my own top ten list. My top few are easy to identify, but after that it’s a challenge. It’s hard to compare mind-blowing/budget-busting meals at Minibar and Komi with more approachable restaurants like Kapnos and Mintwood. And while Osteria Morini or Maple Ave don’t make my top ten, I consider them both favorites. The Post’s “Guide” includes only one restaurant in Maryland– Baltimore’s Woodberry Kitchen, which is on my list as well. After a meal at Ananda in Fulton, Maryland, my top ten may soon be revised to make way for this Howard County newcomer featuring Indian cuisine. As we drive up to the restaurant, nestled deep in the community of Maple Lawn, we don’t see a sign. The building could easily be confused for a clubhouse at a country club. We step inside and the dark wood, semi-formal surroundings do nothing to dissuade the impression. We are seated on a back porch area with a gorgeous view of the sweeping lawn. If you love Indian flavors, be prepared for tough decisions at Ananda. There are nearly a dozen preparations for chicken, and almost as many for lamb. The vegetarian options are plentiful and house-made chutneys like spiced pear or mint, mango, and avocado add depth to dishes already bursting with flavor. 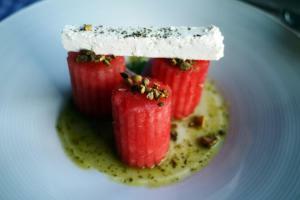 Early October is late for specials that include watermelon with feta as well as chilled summer squash and carrot soup. Since many of Ananda’s ingredients come from its very own farm, we trust the ingredients. The soup is refreshing and vibrant with fresh carrots and Granny Smith apples. It holds up just fine, despite the chill in the air. 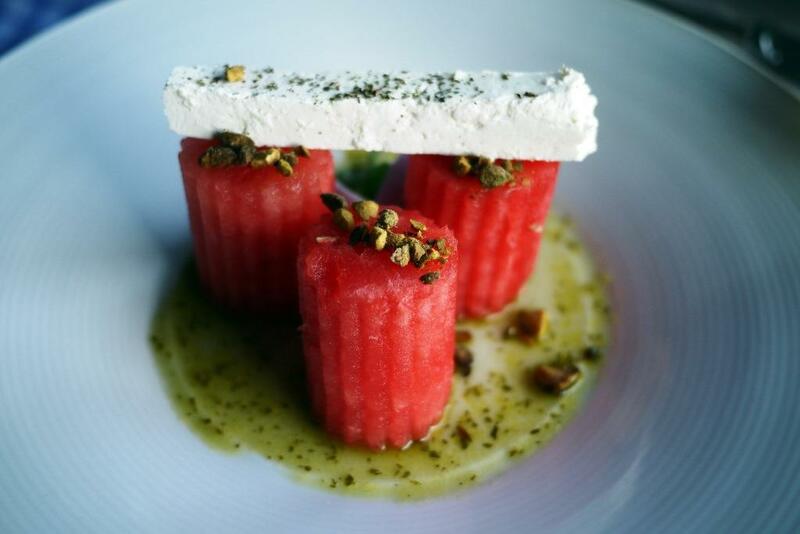 The watermelon salad captures our attention with its beauty, and maintains it with its sweet and salty essence. Avocado and roasted corn with red peppers in white balsamic vinaigrette is attractively presented with a crispy papadam. Every starter impresses us with distinctive and gratifying flavors. Shrimp adrak is in a rich and creamy sauce so tasty that I would applaud if they bottled it. I can imagine the sauce enhancing almost any starch or protein. It’s a fitting companion to the impeccably grilled shrimp marinated in citrus, chilies, and ginger. 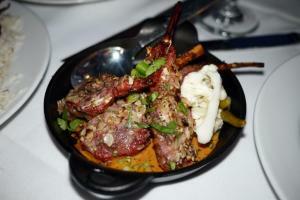 I am powerless against lamb prepared with Indian spices. Tandoori lamb chops are grilled and encrusted in almonds, and served with fresh mint chutney. 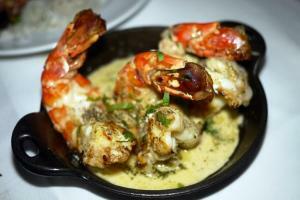 The tangy sauce is terrific – absolutely on par with the zesty cream sauce accompanying the shrimp. 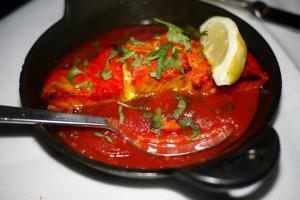 Roasted wild salmon with spicy tomato coulis rounds out the melange of delectable dishes. 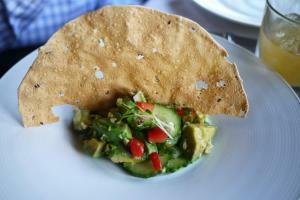 Ananda scores again with the complex savory sauce. The only down side is the amount of rice that must be consumed so as not to leave a drop untouched. Ananda is Hindi means bliss. And that’s what this suburban Maryland restaurant is making me feel. The restaurants that I love most are those that make my heart race when I think about them. Another barometer is whether I am plotting a return visit while I’m still in the restaurant. Ultimately, this is how I select my current top ten favorites in the DC area. (see below). Add Ananda to the list. Note: *Indicates return visit since blog post.